The first time I ever heard of the Bob Graham Round (“BGR”) was last year when Salomon put out the short YouTube video of Ricky Lightfoot’s Winter Round and never imagined that it is something that I would do. That all changed this past fall when Pete Newton began talking about having a go at the BGR and piqued the interest of Ryan Smith and Nick Pedatella as well as myself. Going on an adventure like this with people familiar with the Lake District was a once in a lifetime opportunity and it was an easy decision to book my flight and commit. The BGR is approximately 100k and 27k-28k feet of vertical gain/loss which can vary based on the different lines that you take during the round. 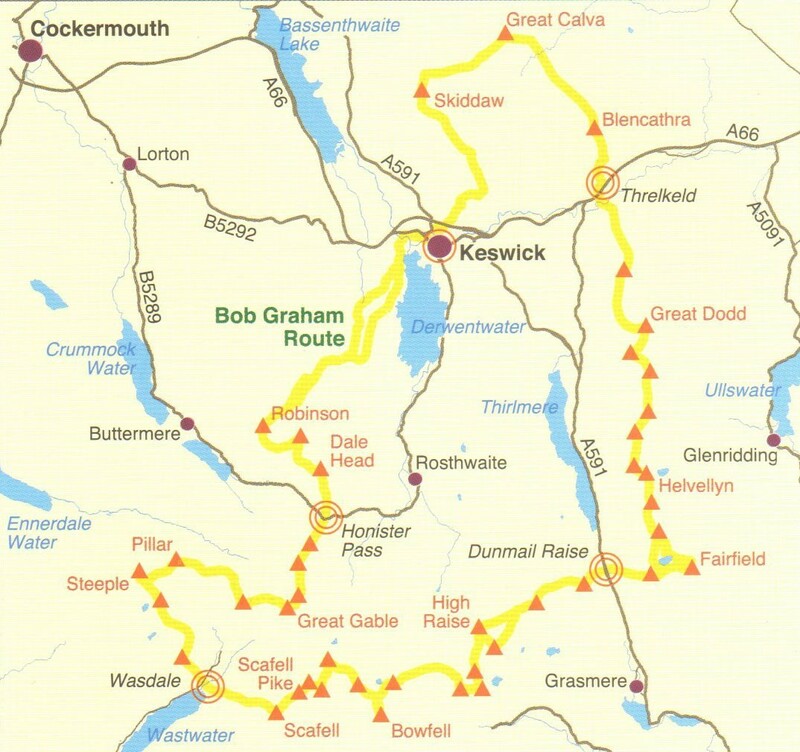 It is broken into 5 Legs: (1) Keswick to Threlkeld, (2)Threlkeld to Dunmail Raise, (3) Dunmail Raise to Wasdale, (4) Wasdale to Honister Pass, (5) Honister Pass to Keswick. Each leg starts and ends at a road crossing which provides you the opportunity to receive aid from a crew (unless you’re Nick Pedatella and do the entire BGR solo and unsupported which is extremely impressive). Each leg is also unique in that each one has a different character in terms of the terrain (rocky vs grassy vs boggy, etc), which helps break up the round in your head while you’re doing it. I had a decent winter of running and felt in okay shape going into the BGR but was definitely not where I would’ve liked to have been. I definitely get spoiled when I lived in Boulder and had miles of trails and mountains out my backdoor and it has certainly been an adjustment figuring out how to train during the week while living in downtown Denver where the majority of my runs are on flat, paved terrain. My training had also taken quite a hit in the 2 months leading up to the BGR as a result on 60+ hour work weeks and an ankle injury. I had to remind myself that all of these things were just mental training for the low points that I would inevitably face during the BGR and using them as an excuse would be pretty weak to say the least. 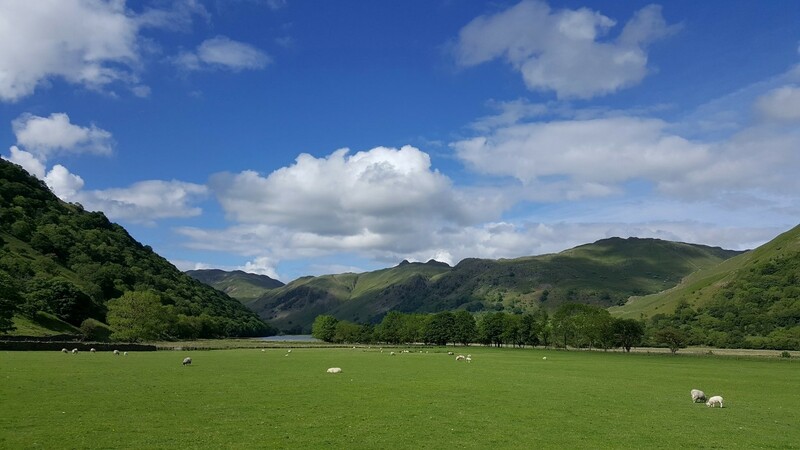 Nick, Ryan, Silke, and myself all arrived in the Lake District on May 27th in order to have a week to recci the BGR and familiarize ourselves with the peaks and best lines between them. We were staying on a small cottage just south of the town of Patterdale and around a 30 minute drive from Keswick. There was no cell phone coverage and no wifi so everyone spent little time on their phones (which is unfortunately not the norm in today’s day and age). Reading books while looking out window at the picturesque landscape of sheep and fells really helped me relax and get my head around the BGR. 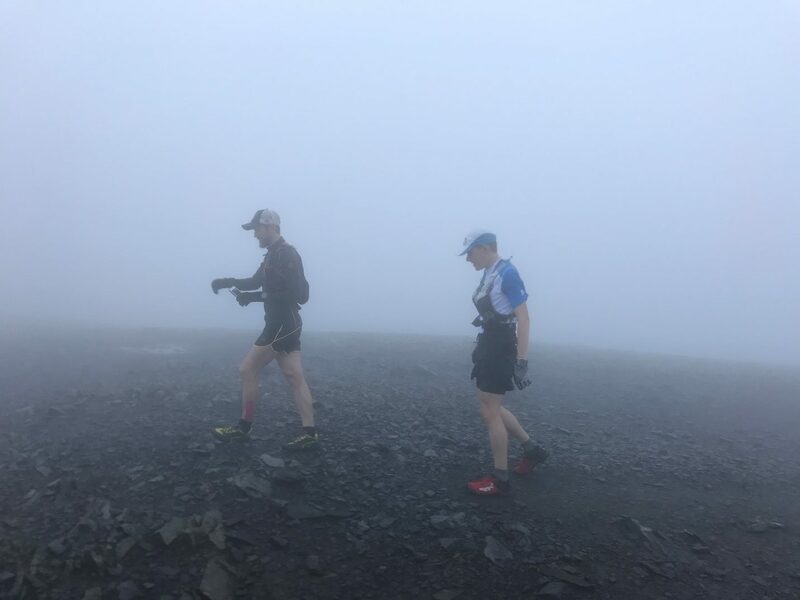 It was raining and late in the day when we got into Keswick for the first time, so our first day of scouting simply consisted of running from Keswick up to the top of Skiddaw (the first peak of the BGR) and back. We were in the clouds at the top of the peak which limited visibility and made it clear how difficult the BGR could be in conditions like that especially if you added rain. Above: Nick and Ryan in the mist on the top of Skiddaw on day 1 of scouting Our second day of scouting was out biggest day. We parked at a farm in Seathwaite (fun fact the wettest place in England) and ran the last bit of Leg 3 of the BGR and the majority of Leg 4. We ran up to Great End to Great Gable which is arguable the toughest portion of the entire BGR. In my head I had imagined most of the BGR to be grassy, muddy, and boggy and was quite surprised by the rocky and rugged terrain of this portion of the round. We had a clear day with magnificent views and I loved the descent into Wasdale which involved “skiing” down a large scree chute before running/sliding down a steep grassy slope to the river. I was struggling to keep up with Ryan and Nick in the last couple of peaks of the day in the rocky terrain, but got through it. On my third and final day of scouting, Nick and I ran the entirety of Leg 2 except instead of going to Seat Sandal we continued over Fairfield and back down to the cottage that we were staying at. It was a cloudy day with a light drizzle at times which hampered visibility. Fortunately, Leg 2 is probably the easiest Leg to navigate and we could still make out features in the distance so we found our way along the route just fine. However, Nick and I took the wrong route back to our cottage off the top of Fairfield in the mist and went 2 km before realizing our mistake. This was yet again a reminder of how much more difficult the BGR would be if we got bad weather during it and I had my fingers crossed that the forecast of clear weather on Saturday for our round would hold. The remainder of the week consisted of mainly resting and indulging in Lancashire crisps, hula hoops, jelly babies, toast, scones, chutney, cheese, pudding, tea, a box of wine, as well as some authentic French Crepes (courtesy of RMR’s own Yves Marie-Hervault). Pete, Nick and myself started our rounds at Midnight June 2/3. 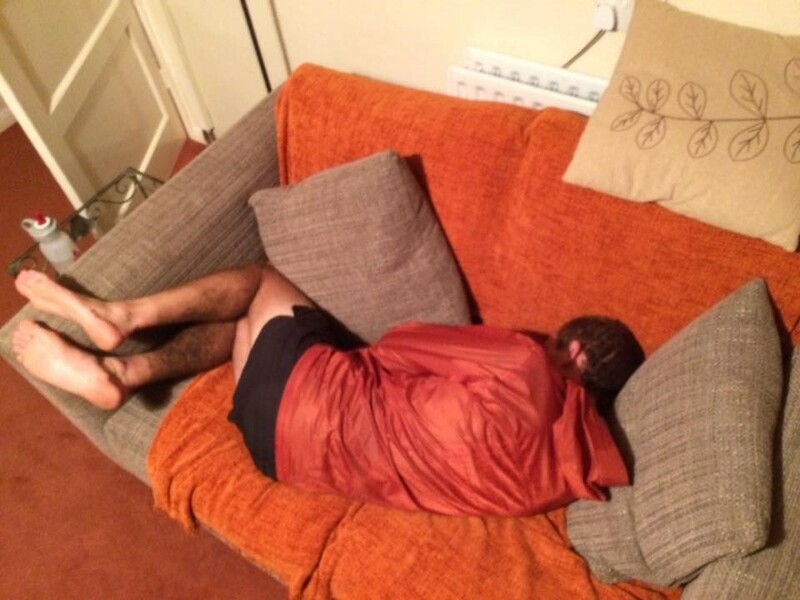 I was able to nap for a couple of hours that afternoon which was quite nice but before I knew it, we were all packed into Will Cawthorn’s car and on our way to Keswick. My stomach grumbled a little during the drive and I was hoping that it was just nerves and not the vegetarian chili that Pete and I had eaten for dinner. 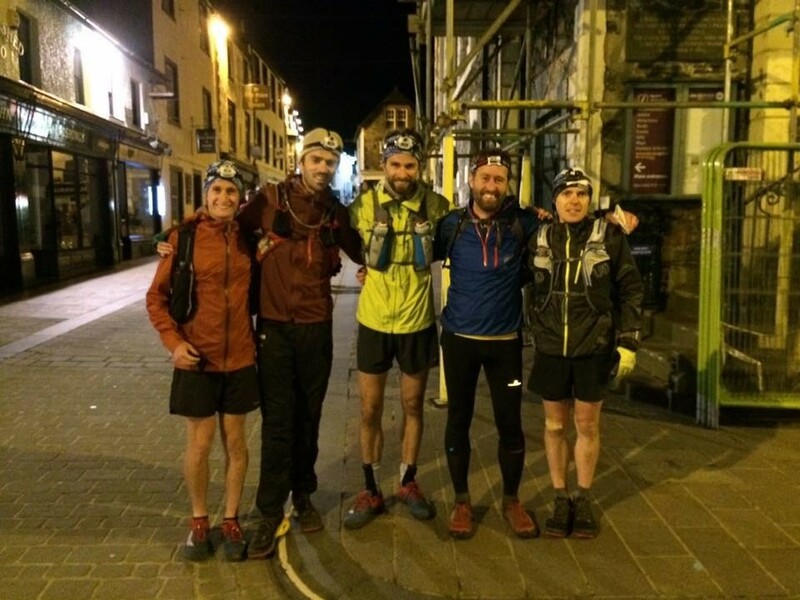 There were two other groups setting up for a midnight start when we arrived at Moot Hall so we decided to set off a minute or two before midnight just to avoid going out in a massive crowd. The route up Skiddaw is very straightforward and, unlike most of the BGR, you follow a distinct path for almost the entire way. Our pacer and witness of Leg 1 was Pete’s older brother David who was quite helpful in navigating in the dark to the next two peaks (Great Calva and Belncathra). On the way to Great Calva we ran through a couple of bogs, one of which almost took Nick’s shoe right off of his foot, but got over to the summit relatively quickly. I’m sure that there is a faster route from Great Calva to Belncathra if you have some local knowledge, but we stuck to what we knew and took the route trodden by BGR runners before us to get to Belncathra. From our perspective and in the dark it was not obvious which peak Belncathra was because it is along a ridgeline across a massive open field/bog. When we got to the top of Blencathra, Pete wanted to wait for his brother for a minute, so I decided to start down the ridge so that I would get to the our aid station before Pete so that we weren’t waiting on each other in order to refill out bottles and eat food. I felt a little sleepy and just okay on Leg 1. It is a difficult leg mentally, because you have to cover a fair amount of distance but you only summit three of the peaks. I could already feel my quads by the time I got to Thelkeld following the long and steep descent of Blencathra which was a bit worrying given how far I knew I had to go. The beginning of Leg 2 was definitely my low point for the entire round. I had started feeling flat on the way down Blencathra and along the road through Threlkled and was hoping that I would start feeling better once I got to Pete’s brother Rob who, along with his black lab, Skye, had set up a mini aid station before joining us for Leg 2. I ate some soup and had some tea before setting off towards the next peak, Clough Head. It is a long run through a douche grade field into Clough Head before getting pretty steep as you get towards the top. Pete pulled away from me a bit as we headed up and I felt sleepy and really low energy. I was breathing relatively heavy and felt like I was giving it my all but I was struggling to keep up. As a mentioned earlier in this report, my training coming into the BGR had not been what I would’ve liked and I briefly allowed these negative thoughts to slip into my mind as I was struggling. I thought about how much (in my view) that my fitness had regressed since this same time last year (when I was in probably the best shape I’ve ever been in). I thought about all of the other people that I run with on a regular basis, including the other RMRs that I was over there with, and how much fitter they were than me and whether or not I even deserved to be there doing the BGR. 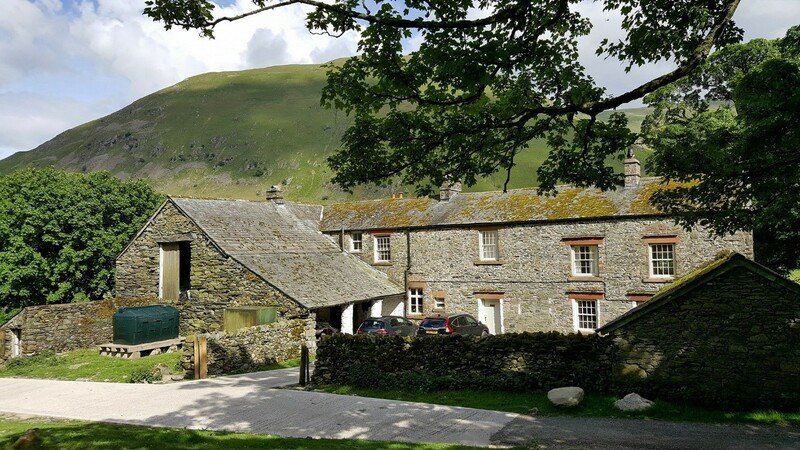 I even thought about reasons why I should stop at Dunmail Raise at the end of Leg 2. 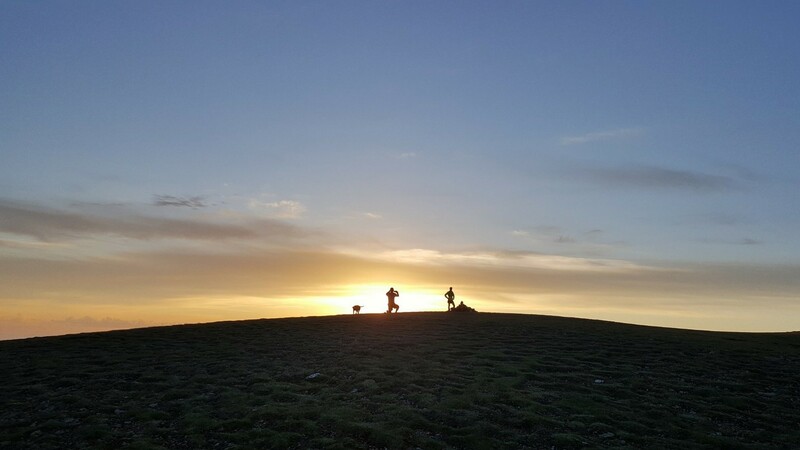 We were greeted on the summit of Clough Head by one of the most spectacular sunrises that I had ever seen and Pete and Yves (who joined us for Legs 1 and 2) encouraged me to take a minute and eat some food. I wolfed down a Mars bar and some jelly babies before setting off for Great Dodd. Leg 2 is quite grassy and smooth terrain and the most runnable leg of the entire BGR. Getting some food in me and getting into a groove by being able to run for long stretches helped renew my focus and energy. I continued to eat a few jelly babies and another Mars bar over the course of the leg and I felt with each passing peak and even led the group up to Fairfield. I missed Pete take a turn on the descent of Seat Sandal into Dunmail Raise and ended up having to cut across a steep slope through a bunch of bracken to get back to the trail. I felt good as I hit the trail and smiled as I felt like my old self and hoping over rocks and descended at a respectable clip. I saw Ryan’s brother-in-law, Matthew, as I got to the bottom and could hear one of his kids (I’m not sure which one as I was too busy trying to not face plant) cheering me on which gave me another boost. At the crossover on the side of the A591, I changed my shoes from the Inov-8 Mudclaws to my La Sportiva Mutants in preparation for the transition for the boggy and grassy terrain of Legs 1 and 2 for the rockier and rougher terrain of the remaining 3 legs. The Mudclaws were great shoes but after wearing them during our recci from Great End to Great Gable I knew that I wanted a beefier shoe for the rocks and I consider the Mutants to be one of the best “mountain shoes” you can buy. Although we (Pete) were enjoying a cup of tea at the changeover, we began the trek up Steel Fell upon Silke’s warning that the camping chair in which said tea was being enjoyed would “explode in 2 minutes.” Pete and I were joined on Leg 3 by Sandy and Mike, who were absolutely fantastic. They were high energy, funny guys who were great runners and knew the route extremely well. Upon summiting Steel Fell you find yourself on a high, boggy plateau which could be a bit tricky to navigate since neither of next couple of peaks are immediately clear. We were moving decently until Pete began to feel a bit unwell as we got to Thunacar Knott. I waited for a minute so Pete could get a couple of dry heaves out of his system before heading off. Although Pete and I had planned on running the BGR together we both knew that we couldn’t wait on each other waste time if one of us fell behind. This strategy ended up working well and helped us both get around quicker than if we had waited for each other because it always gave the person who had fallen behind something to chase and motivation to get going again. The positive energy that I had found on Leg 2 had carried over to Leg 3 and I continued to feel good with each step I took. I felt at my best as I went up Bowfell which happened to be my favorite peak of Leg 3. It was rocky with some sections of scrambling which reminded me of being back home in the mountains of Colorado. Even through the BGR isn’t a race, it boosted my energy even more as I passed a handful of other BGR attempts on my way up to the summit of Bowfell. 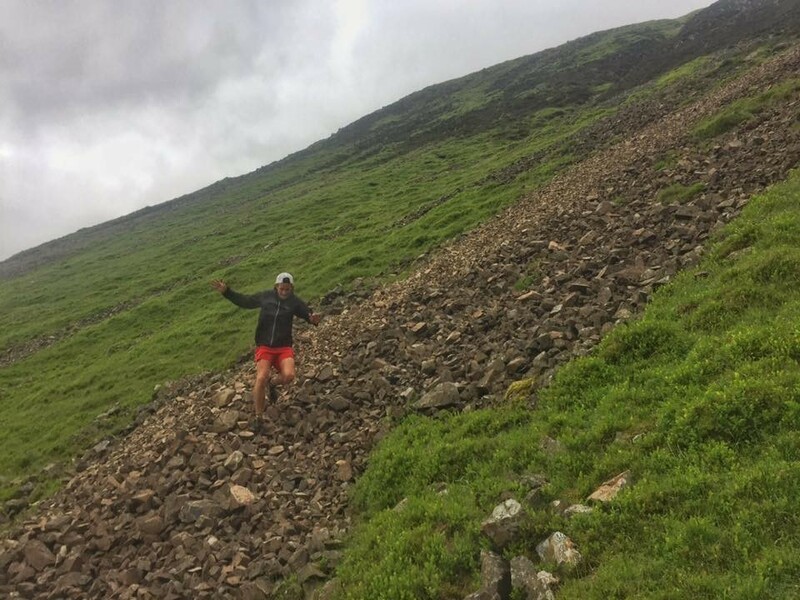 I continued ticking off summits and before I knew it I was at the final peak of Leg 3: Scafell, at which point I was caught by Ryan Smith (who had started four hours after me and was on his way to the second fastest BGR ever in a mind boggling time of 14:17). We had said earlier in the week that if we were both going well we would probably meet at Scafell, so it was fitting that we did. There are 3 options for ascending Scafell and we had scouted two (Foxes Tarn and Lords Rake) but for our BGR attempt Ryan and Pete had organized people to set a climbing rope for us so that we could ascend via Broad Stand which is the fastest and most direct route. After roping up to get through the first section I unharnessed and scrambled the remainder of the way up Broad Stand. The remaining scrambling was not easy especially on the slick rocks and given that if you fell you would land on a large sheet of rock that us slanted downward like a ramp which could take you off the edge and into the hospital (all compounded by the fact that I probably didn’t take the easiest way up after unharnessing). For parts of the scrambling I just thought to myself “I’m so glad my Mum can’t see what I’m doing right now”. The descent down the scree chute from Scafell into Wasdale was not nearly as much fun as I had remembered from my recci, although I suspect that has to do with the close to 45 miles that I had on my legs at this point in the round. I was greeted by Silke and Adam Briggs at the bottom of the path right before the parking lot at Wasdale. Pete’s crew was yet again superb and I ate some more hash browns and soup. I hadn’t planned on changing socks again, but I had stepped through a couple of decent bogs at the beginning of Leg 3 and knew that I had the time and that I would be grateful later to have kept my feet dry(ish). Pete got into Wasdale about 10 minutes after me. There was a little wind which was chilly as I was sitting there so I told Pete that I was going to head off and get a head start. 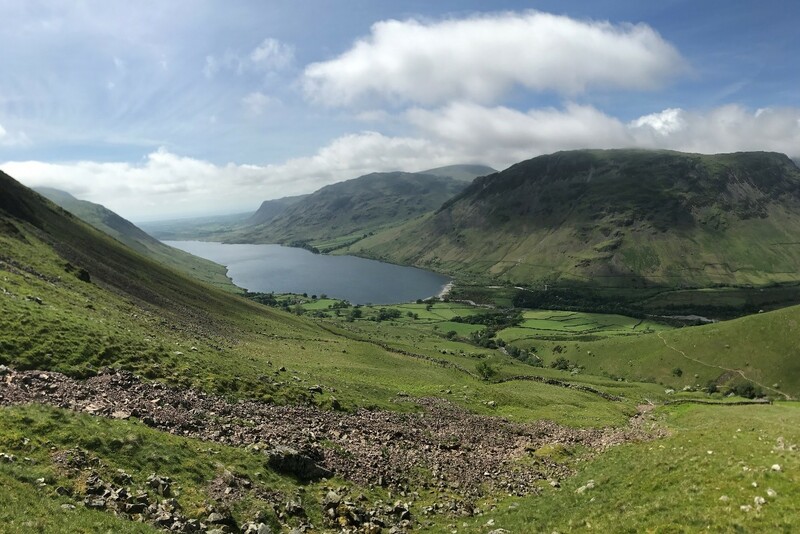 I also wanted to get a little headstart because I knew how steep the climb up Yewbarrow (the first peak out of Wasdale) was. As I got to the base of Yewbarrow I saw Nick Pedatella who told me that he had experienced some navigational issues and taken longer on Leg 3 than anticipated. We started off together before Nick pulled ahead. I was joined by Emma and Hamish on Leg 4 who, like everyone else who was a part of my round, were great people to spend time in the mountains with. Pete caught back up to me after we did the short out-and-back to tag Steeple and was looking really strong. I was starting to get worn out a bit at this point and was struggling to keep up with Pete on the descents. The terrain was a variation of rocks and grass with stretches of uneven grass littered with random throughout it just waiting to trip you up. The most noticeable decline in my running that I have seen since leaving Boulder has been my technical downhill ability. I think that technical downhills are the most difficult part of this sport to get good at and requires constant practice with a bit of reckless confidence. Coupled with the fact that I had suffered a decent ankle/peroneal tendon injury in April, my confidence to bomb the descents was not very high so I took it easy. Fortunately I am still a decent climber and could make up for the ground that I lost on the descents as we climbed the next peak. I had only seen the final three peaks of Leg 4 on a map and it felt like it took a long time to get down to Honister Pass, especially since I was not moving particularly quickly. Pete pulled ahead of me a bit at this point and he was already comfortable at the crossover at Honister Pass upon my arrival. I could hear people cheering as we got close to the Crossover which was a great boost yet again. I was hungry when I got to Honister Pass and ate four hash browns and some soup before heading off to the final leg. We knew that we had plenty of time and would probably finish with a respectable time which made for a jovial mood as we began the climb up Dales Head. We were joined for the final leg by Sandy (who had run with me on Leg 3), Rob Hartley, Will Cathorn, Robert Bell, Joe Hawes, and Molly (a black cocker spaniel powered by enthusiasm and sausages). The climb up Dales Head was not that steep in comparison to some of the other peaks that I had seen earlier that day but it felt long. However, I knew that once we summited Dales Head, the final two peaks, Hindscarth and Robinson, were just bumps on the way back home to Keswick. I felt strong on the final two climbs and ran the entire way from Dales Head to Hindscarth but fell behind as we began the descent down to the road back to Keswick. The top section of this descent to the road is steep and rocky and affectionately referred to as “the fall” which gives you an idea of the steepness, particularly if you happened to wander off the side. As we hit the bottom of the descent and everything flattened out it felt great to stretch the legs out and run, particularly on a soft surface. From the last few peaks of Leg 4 to the end of the BGR the bottoms of me feet were quite sore. The combination of moisture and jagged rocks had taken their toll and by the final descent of Leg 5 every step on a hard surface stung the balls of my feet. I was grateful every opportunity that I had to run alongside the rocky trod on a bit of soft grass in order to give my feet a moment of relief. There is a small parking lot at the beginning of the road into Keswick where some people choose to change into more comfortable shoes for the final 6 or 7 km along the road. I got to Pete right as he was finishing putting on his road shoes. The entire section on the road went by quickly. Pete and I were spurred on by our pacers positive energy and our pride in ourselves that we were about to successfully complete the Bob Graham Round. At times along the road we were doing 7:30 miles or quicker and ran the couple hills that you hit along the way. As we turned off onto the path cutting across the field to Keswick, Sandy made sure that Pete and I were in front, together to lead the way home. We turned on to the main street and caught our first glimpse of Moot Hall. Pete and I agreed that we would sprint it in upon hitting the cobble stones for the final one or two hundred yards to Moot Hall. As we hit Moot Hall and touched the door at ground level we were reminded by Nick, who had finished a few minutes before us, that in order to officially finish we actually had to go up the stairs and touch the higher door. 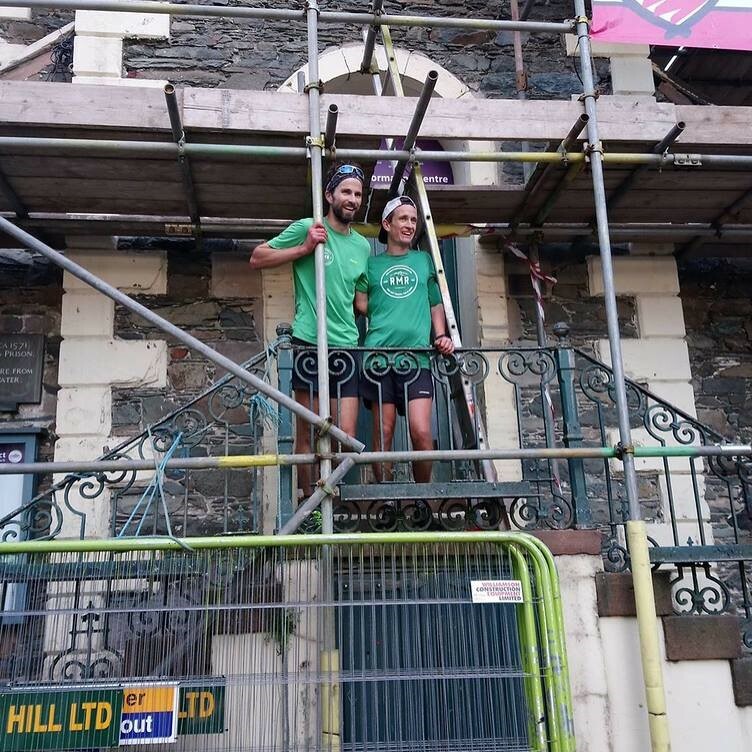 We walked up the stairs and both gave the door an emphatic slap and we were done, we had completed the Bob Graham Round in 21 hours and 20 minutes. 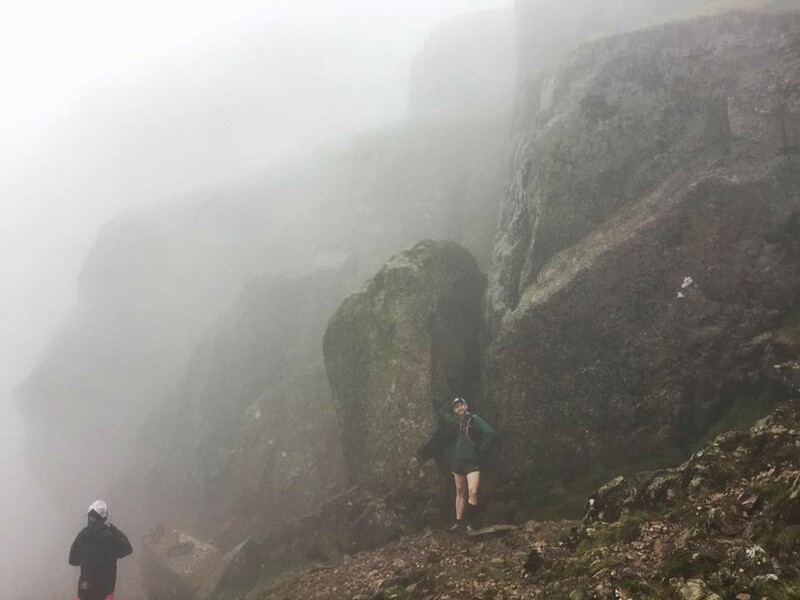 This is an excessively long write-up already and I easily could have written twice as much about my experience of running the Bob Graham and my week in the Lake District. None of this would have been possible without Pete, Ryan, and Silke who basically organized everything from lodging to pacers and I am truly grateful to all of them. I am also thankful for all of the people who came out and ran with us and supported us during the round. It is a time consuming task and involves a lot of waiting around and touching more disgusting feet and socks than anyone ever should and everyone was absolutely brilliant and positive and it would not have been the same experience without them. I would also like to give a shout out to Adam Briggs who met with us earlier in the week to talk about the round, was at ever crossover offering his support, gave me his jacket to stay warm after I had finished, and joined us at the pub to celebrate. Adam epitomized the community aspect for which fell running is famous. 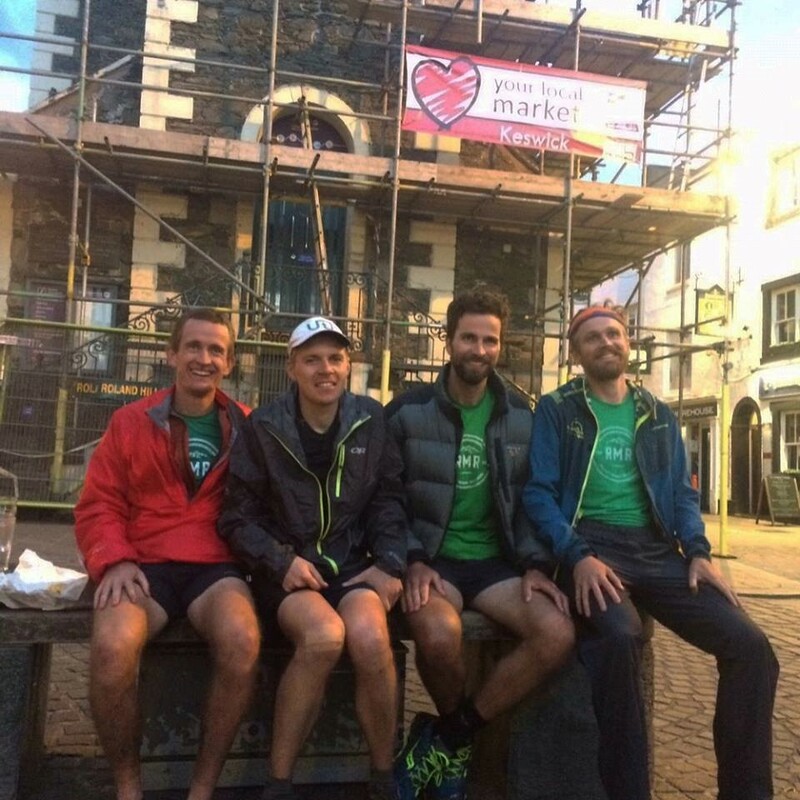 The Bob Graham Round is as challenging as it is beautiful and I am remarkably fortunate to have had the one in a lifetime opportunity to attempt it and couldn’t have asked for a better group to do it with. Pete, Nick, Ryan, and Silke are great runners and I am lucky to call them my friends. 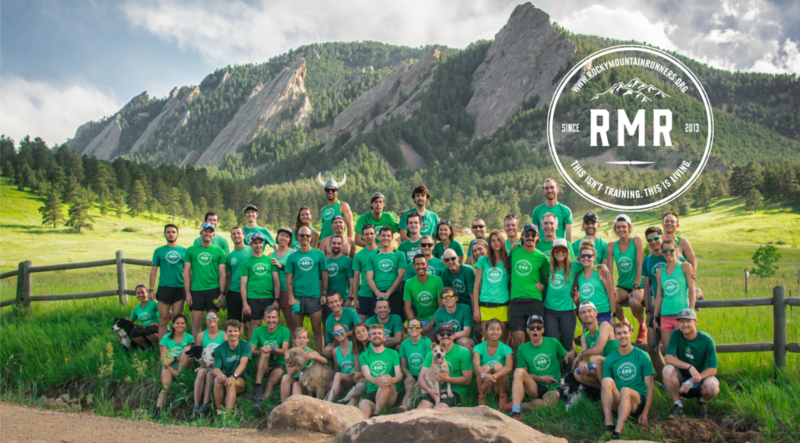 I am also extremely lucky to be a part of Rocky Mountain Runners (“RMR”), which has given me the chance to meet so many great people and be a part of a group that does awesome things like the BGR. If you want to good at something you should surround yourself with successful people who push you to improve yourself every day and that is what RMR has been for me. Even when I was feeling bad, I knew that back in Colorado our friends were checking Facebook for updates on our progress and cheering us on. This was just the beginning of another great summer of running and exploring the mountains and I can’t wait for the next adventure.